Hyperhidrosis most commonly manifests itself in three bodily areas: the armpits, hands and feet. 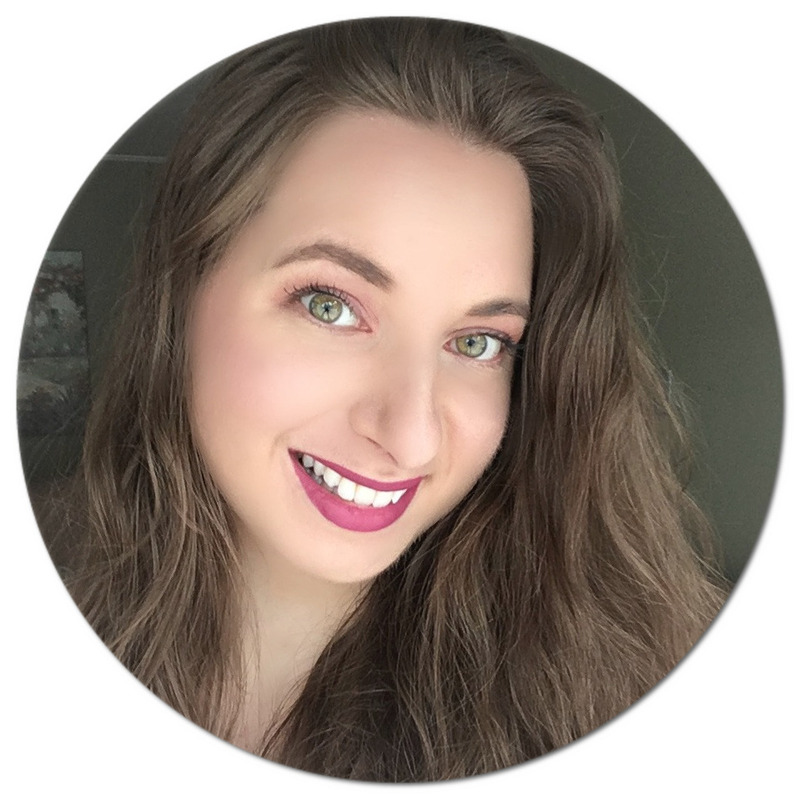 I mostly deal with excessive sweating in the former two areas, so I was looking forward to experiencing how an iontophoresis treatment could help. Symptoms of hyperhidrosis include having your palms and soles feel very moist (mild case), pearls of sweat forming (moderate case), to dripping sweat (severe case). 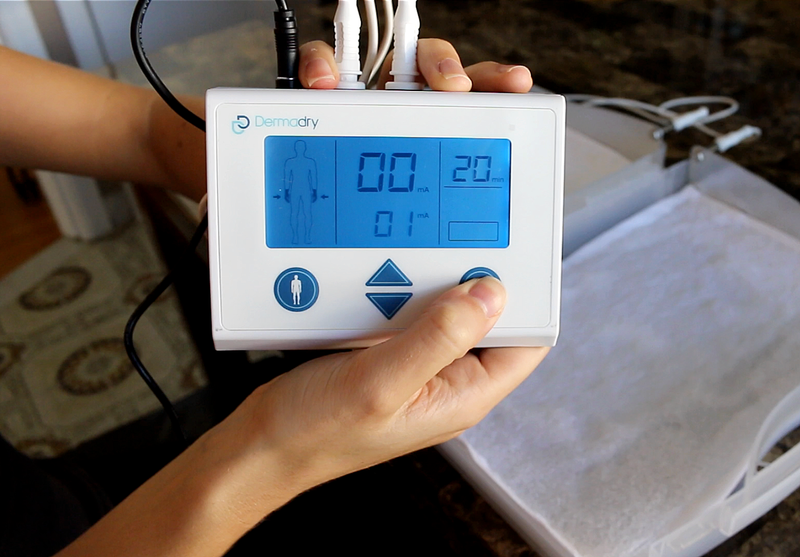 The technology behind the Dermadry iontophoresis machine is quite simple: it uses tap water to deliver a mild electric current through the skin's surface, and this basically "turns off" your sweat glands. It might sound scary, but the treatment is painless and safe (needle-free and drug-free) and is also certified by Health Canada, clinically proven and recommended by dermatologists. The results are not immediate, however, you will start seeing results in as little as 1-6 weeks of regular treatments, depending on the severity of your hyperhidrosis. Then, you can perform more spaced-out treatment sessions to keep you dry. 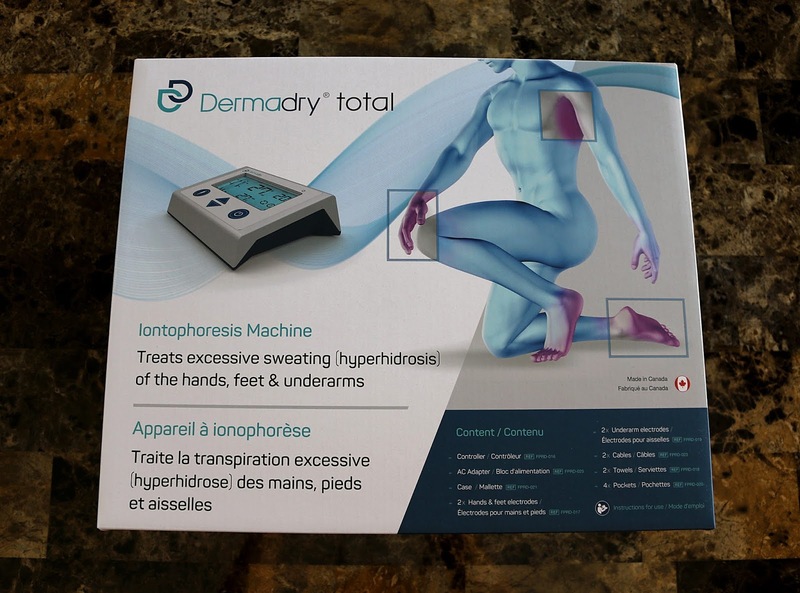 The Dermadry iontophoresis machine I received treats all three areas mentioned above, however, they also offer "underarms-only" and "hands and feet-only" devices. The devices are meant to be used both during an initial phase and a maintenance phase. During the initial phase, you need to perform treatments 3-5 times a week for up to six weeks to start experiencing an improvement. To "upkeep" the reduction in excessive sweating, it is then recommended to use the device once every 2-3 weeks for mild cases of hyperhidrosis, once per week for moderate cases, or three times per week for severe cases. When I first saw the device, I won't lie in saying that it looked quite daunting. However, using it is very straightforward and only requires for you to get some tap water, connect a few wires, press a couple of buttons and sit back and relax, as you will see in the demo video below. The treatment profiles (underarms, hands and feet) on the controller can be easily selected and the current strength and countdown timer are already programmed for each profile, although you can adjust the current strength if needed in active mode. For the underarms, treatment-time is 15 minutes, and for the hands and feet, 20 minutes each. Once the device is activated, the current is gradually increased to the setpoint. The device will automatically pause if you remove the electrodes from your underarms or if you lift your hands or feet from the towel-covered electrode plates and will automatically resume the treatment once you place them back on. The towels and the pockets are reusable and can easily be washed, and you can purchase replacements as well. The underarm electrodes have been soaked in tap water and squeezed to ring out any excess and have been covered by pockets so that the top layer of my skin is protected during the treatment. 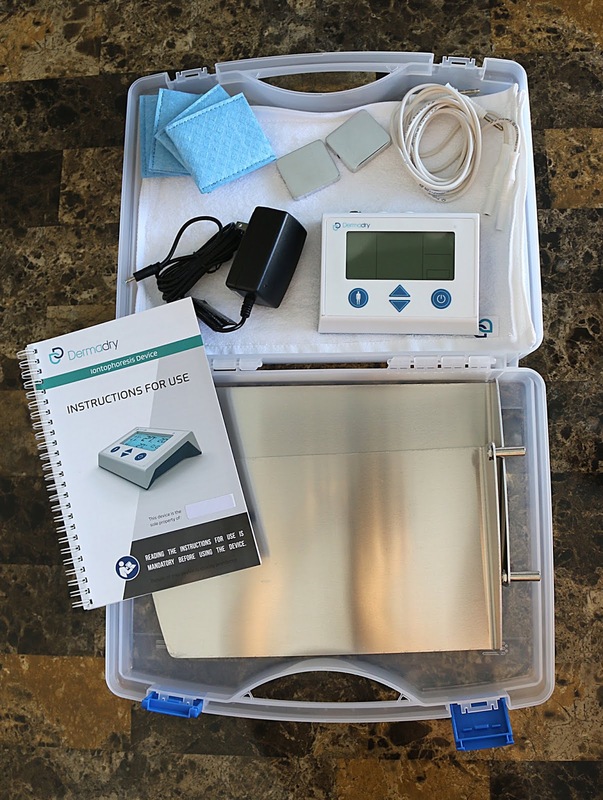 For the hands and feet, the dual-function case has been separated into two for ease of use, towels are placed over the electrodes and tap water has been poured on top and absorbed before activating the device. Here are a few precautions to keep in mind: you may experience a slight, painless tingle sensation during treatment, which for me occasionally happens when treating my hands. Not to worry as this side effect is only temporary. You may also deal with dry skin in the treated areas, which is why it is recommended to moisturize after each treatment. If the pockets of towels are not properly aligned to cover the electrodes, you may also experience irritation and skin redness. You may find that you are sweating more following the first few treatments, however, do not worry as with continued use this will no longer be the case and your hyperhidrosis will be a thing of the past. If you suffer from a health condition and are unsure if this solution is right for you, please seek advice from a health professional. Using the Dermadry iontophoresis device has been quite life-changing, to say the least. I've been using it for almost six weeks and noticed my sweating significantly decrease at the end of the two-week mark. I am currently maintaining my treatments once every other week. 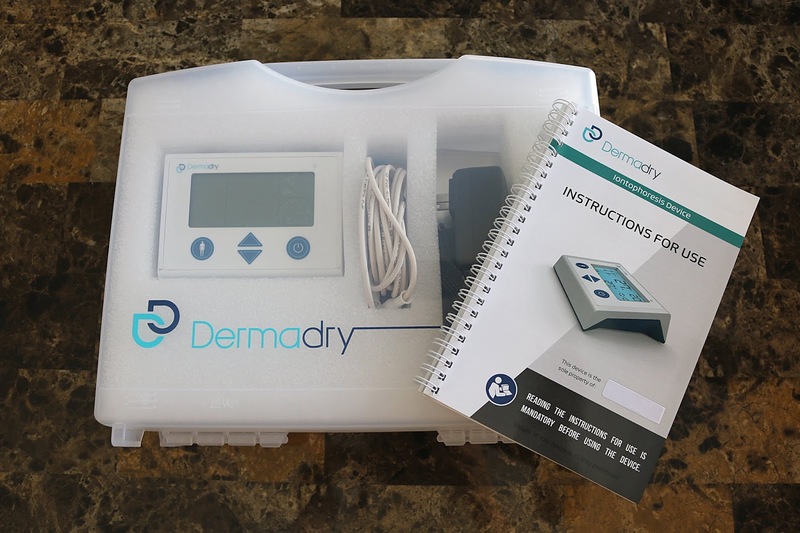 The Dermadry Total is certainly an investment, but considering that you don't have to spend thousands of dollars on in-clinic treatments, it is well worth the price in my opinion. It retails for C$462 / US$349, and you can use code Natalie10 to get 10% off your order! Dermadry prides itself in being made in Canada and offers free international shipping as well a 60-day guarantee and one year warranty. If you also suffer from this condition, I hope this post was helpful. Know that you are not alone! Do you suffer from or know somehow who suffers from excessive sweating? *Disclaimer: This post has been sponsored by Dermadry. All thoughts and opinions are my own. I had no idea this was even a thing. One of my good friends sweats like a man and she need to do this. I'm so glad there is finally an option available for people with this problem. I have a friend who sweats excessively, and it makes her so self-conscious. I need to look into this. Sometimes I feel like I sweat way too much. This sounds like a great way to help. I didn't know anything like this was around for those that sweat so much. Good to know and it does look like it would be hard to use when you first see it set up. You walked us through it completely and not so bad now. I have never seen something like this before But I do know a few people that would love something like this. I will have to show them this cause I am pretty sure they will try it. I have a friend who experiences excessive sweating. I didn't realize there was a product like this and I'm sure it would help him tremendously. That system is a great idea for people who can not affod to sweat or feel uncomfortable. I never knew you could resolve this problem so easily. Wow.?! I never knew such a product existed. Sounds like an affordable option to costly medical visits. Like everyone else, I didn't realize such a product existed. I never sweating excessively but with menopause that has really changed. This looks really fascinating. I don't sweat a lot, but this still is something I want to try just to check it out. I've always suffered from hyperhidrosis, especially if I feel nervous. It's great to see a new option to treat it. I would give this product a try! Excessive sweating seems so hard to deal with. I'm glad there are things like this available to treat it. That's an interesting treatment. I don't have this issue, but it is nice to know that there is a way to treat it that looks pain free. I'm not an excessive sweater but I have friends who are and I will def be passing this post on to them! Thanks! Was not aware of this product. I wonder if it is available in Mumbai. They will do good business here. We sweat almost eight months in a year. I am really interested in this ,sounds great for my palm and feet that keeps sweating all the time especially when summer. This dermadry is the answer for my problems! I am not sweat excessively. One of my best friends have this problem. I will share this with him. This is my first-time learning of this product. I have to look into possibly getting it. I have never heard of this before! What a great option for those who struggle with excessive sweating. Now that I know about it, I'll share it with others. Thanks! 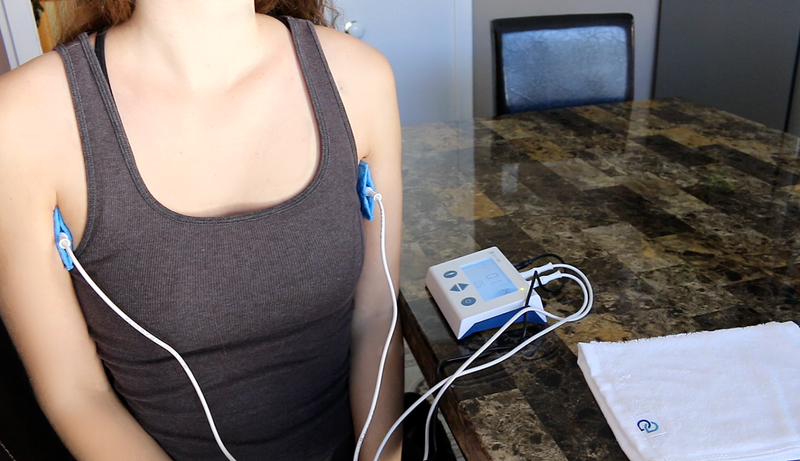 The iontophoresis device is something totally new to me. Though I do not have the issue of hyperhidrosis, this is pretty useful information that I will share with others. Interesting. I've not heard of this product. Does it really helps? I am so interested on this I sweat on my feet every time I sweat sneakers it becomes uncomfortable esp. on summer time. I never knew anything like this existed. I know a few people that would probably want to try this. I have never seen anything like this before. I definitely have an issue with it so will be looking into the system. There are so many that tend to have this happen and are embarassed by it. Glad to see that there is something that they can do in home. I have the opposite problem, I never sweat! But this is amazing, did not know this even existed. I had no idea that they had something like this! I know one or two people that have this issue! I have never use this kind of derma stuff but this is worth a try. But its best to be always play safe. When I workout, my armpits are the ones that are so sweaty, I don't like the feeling. I would love to give this a try. I don't sweat but it's good to know that this device existed. I'll share this with friends who has sweating problem. This is so great! Having to go to clinics for this kind of treatment is really a hassle for me, and besides it costs an arm and a leg. So to do it at home would be heaven. What a great way to help calm the sweaty armpits. I have a friend who has this issue. That's interesting to hear there is even something like this out there. My first to hear of it. WOW! What a fancy piece of equipment to determine excess sweating. It's amazing how many products are available these days to diagnose yourself from home. Certainly helps avoid the embarrassment of having to go to a doctor. This is fascinating! What an interesting piece of technology, I'd never heard of it before! Thanks for sharing this, I'm sure it will really help some people! I must confess, this is my first time to learn about this one. I am curious how will it be when I am the one actually using it. Very interesting. Very interesting, I would love to try this. I suffer excess sweating on my face. Wow! I have to look into this. I know a few who needs this! It's amazing how it can be cured by this machine. I was not aware something like this exist. I can suggest people now. Thanks for the information. Eeesh! I feel like I would like to try this. My back sweats a lot in really hot weather as well. I wonder if they have a model that would include that area. Also curious whether there is any reimbursement from insurance. I had a hysterectomy a year ago this past January which through me into menopause and horrible hot flashes which make me feel like I’m burning and I start physically sweating horribly. I’m not sure if this device would help with my situation but I do want to find out. Thanks for a great review.